Credit: Arthur Velker Student Loans a thing of the future? Two weeks ago, thousands of students took to the streets of Dublin with placards in hand and a message for the Taoiseach that made its way out of a cacophony of stomping feet. The message was simple: no student loan scheme. A warning to the new government made it clear that any attempt to impose debt on college students would be met with furore. And it most certainly wouldn’t be forgiven. Under the illusion that a loan scheme would leave them burdened with debt, students dismiss the slightest indication of potential such a system could hold. But upon close analysis, it is evident that an income-contingent loan scheme could deliver in many areas where our current one fails. The €3,000 annual entrance fee, applicable to all students, is seen by the government as a justified contribution to education. At least half of the fee must be paid at the point of entry, with no possibility of deferral. 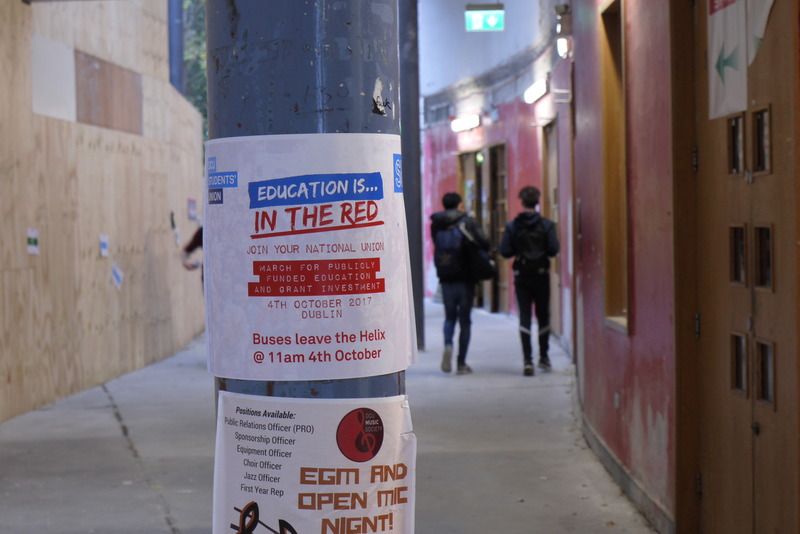 The state support system, Student Universal Support Ireland (SUSI), which offers grants to cover fee payments, put its number of applications at over 108,000 this year – around a third of the total number of third-level enrolments. Around 84,000 students were awarded the grant, while the other 24,000 applicants were rendered ineligible. Most of the unsuccessful candidates were disqualified by way of an income means test. For a mixed-house income with up to four children, SUSI’s maximum threshold is €54,240 — two relatively low full-time wages, minus tax. John Tynan did not satisfy the eligibility requirements in his first year of college because his father’s salary fell outside the bracket. John lives in a modest, detached house in Trim, Co. Meath, with his little brother and sister. Both of his parents work full-time jobs. Now in his third year, he has been reliant on bank loans to pay for his student fees every semester. John’s parents helped him with his first and second loans when he was unemployed, but now he’s on his own. John works in retail, pulling four-hour shifts three days a week and earning around €140 – the standard retail wage. But his college timetable requires attendance Monday to Friday and the weekly Dublin commute ticket weighs heavily on his expenses, costing him half his job income. His bank gives him an option to defer his loan for three months, so he doesn’t have to begin his repayments until January. This gives him a bit of time to save up. Since college fees require immediate payment, a significant stock of young people pass through college doors taking on a debt they must repay throughout the course of their study, usually with the help of a part-time job. Bank loans offer little by way of flexibility and often have various interest rates attached to them. This means if you don’t meet SUSI’s eligibility requirements, you’ll likely rack up a hefty bill of around €14,000 by the time you graduate, a significant sum of money that could be used to fund a startup or invest in your career. However, on the other end of the spectrum, there are colleges desperately in need of funding. In their latest figures the Higher Education Authority recorded over 24,000 more third-level attendants compared with five years ago – an increase of 11 per cent. In the face of this growth, staff numbers have remained virtually static. The number of academic staff nationwide has remained approximately nine thousand over the past five years, with the only notable increase occurring in 2015, when the number of staff rose by 90. The Cassells report, released last year, estimates that in order to cater for the growing demographic and facility shortages, funding for third-level institutions will need to be boosted by an additional €600 million a year up to 2021 – and over €1 billion per annum thereafter. The figures talk and they illustrate a bleak outcome for the future of Ireland’s third-level education sector. One of the three solutions suggested in the report is an income-contingent loan scheme based on the UK model. It sees students effectively borrow from the government to pay their entrance fees with no obligation to pay back until they have secured a steady income. In the UK, the payback starts when graduates begin earning over £21,000 (roughly €23,000) per year. Anybody below that threshold is excluded from repayment. The sum is collected through an integrated tax system. The amount you earn over the threshold is taxed at 9 per cent. For example: if you’re earning £35,000, your repayment won’t be 9 per cent of the total salary, but nine per cent of £14,000 – which is how much you are above the threshold. The result of that is £1,260 per year. To compare that as a percentage of your total income, it is 2.7 per cent. The rate of the Universal Social Charge is five. If you lose your job or fall below the threshold, the repayments will cease. People like John would significantly benefit from such a scheme. It would give him substantially more offerings than his current loan, which requires repayment regardless of circumstance or income. The debt prospect puts a thick, dark cloud over people’s judgement but it doesn’t take into account that UK college fees are four times higher than those in Ireland. With the example cited above, it would take 38 years to repay the loan, but in Ireland it would be cleared in less than 10. Rejection of the suggested loan scheme will most likely lead the government to implement one of the other two solutions outlined in the report. One of the suggestions is a revised version of our current system. This would retain the student contribution fee, provide a government grant to those from lower-income households, and place the responsibility of additional funding on the state. The other option, appearing to be the most student-friendly, involves the complete abolition of the contribution fee. In this instance, the government would provide the major sum of funding to third-level institutions and education would be free to all EU students. While sounding more like a sweetheart deal, the report doesn’t specify how the latter scheme would be funded. Such an experiment would likely result in huge ramifications for the taxpayer. “The contribution in fees that students make is not enough, and the government still contributes a lot of money to universities,” says Christopher Jepsen, Assistant Professor at the UCD School of Economics. Although the loan scheme seems like a reasonable solution for those who currently rely on banks, it has pitfalls. Because it relies on returns over a long period of time, most Irish institutions wouldn’t feel the effects of student funding for another 13 years. According to the report, by this time, third-level education will be heading for the tar pit. This is exacerbated by our troublesome emigration rate. Jepsen says that the government would not likely recover a lot of the loaned revenue due to the large number of people leaving the country. He suggests the scheme would work best as a hybrid in which the loans system works to raise additional funding but is part of a bigger scheme that provides financial assistance to those with low-earning incomes. One thing that is indisputable is that institutions need urgent funding. Education should be cherished. It is the bedrock of society and should be viewed as a paramount aspect of young people’s lives. But we also need to recognise it as something else. Education is an investment. And the one thing all investments have in common is that they all need a little capital.